As of today Directv subscribers will no longer be able to view a Pay Per View (PPV) movie purchase for more than 24 hours (link). The ability to watch a movie in several sittings has been a major plus for my wife and I over the last 12 years as Directv subscriber. When I upgraded to HD, this was one of the major selling points for us to stay with Directv. This weekend we watched "Into the Wild" and it would have been a drag to watch the 2 and 1/2 hours in one evening. Watching a movie over multiple sittings may be heresy to movie buffs, but I find that it allows you to ponder the story. What I find interesting about this whole situation is that we seem to be in the minority. There does not seem to be a major uproar from subscribers. I googled forums on the subject and found very little dissension. I could not even find a post on the subject on the dbstalk.com forum, although they seem to be less and less independent. For our use this probably means we won't be purchasing any more PPV movies, we may become NetFlix subscribers and it opens up the door to switch to FIOS TV. Since I currently use FIOS Internet, the current triple play promotions is probably a cheaper solution than Directv. I would have to balance the promotion against the purchase cost of a Tivo HD DVR, since it looks like the current FIOS Motorola DVR does not allow the use of the eSATA port for my 1 Terabyte hard disk array. As telecommunications, the internet and television technologies merge, it seems that flexible consumer solutions are becoming harder and harder to find. I understand the fear of piracy, however I feel Digital Rights Management is hampering my legal rights to use the content I purchase. I can understand movie studios not wanting us to keep a PPV movie indefinitely but 24 hours is a ridiculous time frame. I think 72 hours would be more appropriate and would work for us. I agree that if someone wants to keep a movie indefinitely they should purchase a DVD or permanent download. In the end this is a big step backwards for Directv who has been a leader in providing advanced technology and content to users. It seems to only advantage they have left is for the die hard sports fan. However, as those contracts come to an end and the cable/telcos offers the same packages, Directv may have a real problem on their hands. "[D.P. adds: According to a study by the Leichtman Research Group, 50 percent of HDTV owners aren’t actually watching any high-def shows on them… but 25 percent of them *think* they are.]" I find this to be the case when I discuss HDTV with friends and family. They also have a hard time understanding the different aspect ratios (4:3 for SD and 16:9 for HD) and why they get bars when viewing certain programs on an HD channel. They don't understand that even when a station uses an HD channel they don't always transmit in HD. The broadcasters seem to be way behind curve, I don't think they expected the public to buy into HD the way they have. Late last week I received my firmware upgrade kit from Sony for my KDL46-XBR2 TV. I had gotten an email back in December providing me details on how to order the upgrade (link). The upgrade also applies to some XBR3 and XBR4 units. I have been very happy with the TV, so I was surprised to hear of the firmware upgrade. In the past Sony has been very stingy about providing any kind of software/firmware upgrade across their product line. This is definitely a positive development and hopefully one that will continue. I don't think they could have made the update any simpler. I received a USB Flash drive and instructions. A USB port is located under a cover labeled "maintenance port" on the back of the TV. You remove the snap on cover, plug in the USB Flash drive while the TV is on and the upgrade starts automatically. It took about 10 minutes to complete. I don't know if it is my imagination, but the picture seems brighter and seems to have more contrast. The USB Flash drive with the firmware upgrade. Last week Directv started rolling out a version 0x1b4 to the HR20-700 DVR which I just received this morning. In addition to general performance improvements (release notes), this version adds Directv's implementation of Video On Demand. The Video On Demand only works if your HR20-DVR is connected to the Internet. From what I understand it starts the download of the program via the Internet connection and starts playing within a couple of minutes. VOD seems to be very popular with cable users. With this new feature Directv can now match cable functionality. The VOD screen via my Sling Player, the program is still in Beta. As of this morning I had no programs to choose from. 10/31/07 update: Last night when I came home, the Directv On Demand lists were populated. I was able to queue up a program and within a minute start playing it. The technology is pretty cool, however the content needs works (no HD content yet)....Once the show starts to download, it becomes part of the list of shows on the DVR. Last week Directv started to officially transmit their new HD channels to all subscribers. At last count they had 27 new HD channels up and promised to have 100 by years end. The reason I am writing this post is that I have been very impressed with their transition from SD to HD. They took the approach of using the same channel numbers for SD (Standard Definition) and HD. If you have a current HD receiver or DVR the HD channel is automatically selected. Their is no need to learn new channel numbers. The channel issue is probably the most confusing for the non techy. I can't tell you how many times I have been to someone's home with a new HD set and had to explain that they now needed to specifically tune to the HD channels. And even more confusing is when a network transmits the HD logo overlay on the picture and people think that they are watching HD when they are actually tuned to the SD channel on their cable system. They are so disappointed with the picture quality that they think there is something wrong with their set. Even though I was not that happy with Directv's customer service during the installation process, they almost lost me as a customer of 12 years, my perseverance has payed off. I love the service, the HR20 700 DVR with my 1 Terabyte external disk has been rock solid (I think I have performed 2 forced reboots since April). My only complaint has been the weak over the air tuner (compared to my Sony KDL46XBR2) and the occasional pixelation (this has gotten better). It looks like CBS read my rant (LOL) with their Sunday afternoon/evening schedule last weekend they started showing 60 minutes at 7:30pm. This was a simple fix, however I think the networks should still work towards a real time DVR guide update. I am returning from South Carolina today and was very happy to have access to my Slingbox to watch the Washington Redskins yesterday afternoon (unfortunately they lost). I was able to connect my laptop to a 27" Samsung LCD TV. The quality was as good as standard definition television, although SlingPlayer had some rendering issues during fast play action. The action was viewable but a bit out of focus. I am sure having my Verizon FIOS 2Mbps upload at home, helped. The bottleneck was probably the DSL connection my PC was attached to. I used my iPhone quite a bit over the last week. It touch screen is addictive and fun to use. Apple has a ways to go to provide more functionality and applications, but they have a great start. My biggest complaint (other than the lack of Exchange ActiveSync) is the Bluetooth stack (funny ,early Windows Mobile stack were lacking as well). Apple really needs to provide the A2DP profile for stereo headphones, they also need to provide a filtering mechanism for transferring contacts to an in car Bluetooth phone adapter, as well as caller id and signal data. With the upcoming release of the iPod Touch on the 28th, it will be interesting to see what updates are provided to the iPhone. My review of Ilium ListPro 5.0 has been published on pocketnow.com here. Finnish my review of the Etymotic ety8 Bluetooth headphones. Continue my comparison of Windows Live Search and Google Maps for Windows Mobile. It is Monday morning and I have a rant about football, program guides, and technology. Ever since the big viewer outrage (at least 15 years ago) over CBS cutting off a Giants game (I think it was) to start the 60 minutes show at 7PM, all of the networks have allowed premiere sporting events to be viewed until their conclusion, and then start the next show. In today's world of DVRs where you can select a show by title and not have to worry about when it will air, I don't understand why the program guide cannot be updated in real time. I have a Season Pass for 60 minutes on Sundays at 7PM, however during football season it never starts at 7PM, yet the guide shows 7PM. This means that if I do not want to miss a 60 minute story, I have to add minutes or record the show after it. Why do the cable and satellite companies use arcane technology (batch processing) for updating their program guides. The television network control centers plan for the delay and should be able to provide an estimated lag time in real time to the program guide providers and in turn download the update to our DVRs. The DVR can then automatically adjust their recording times. This is not "rocket science"! I have had fun playing with the iPhone last week. The touch interface and Safari browser are exceptional. It has it shortcomings (more to come on these, even the Apple store associates I have to talked to agree), however it does provide Apple with a truly innovative platform. After my post on the "irate Apple followers", the comments have been thoughtful and have forced me to refine or redefine my thinking about Apple, their products and overall strategy (I am not done commenting...). Even though they are a minor player in the desktop/laptop arena, the fact that they are the undisputed market leader with the iPod gives them a great deal of power in our personal digital lives. I am keenly interested on how they use that power, the iPhone is clearly a projection of that power. It is interesting to note that the Apple web site clearly lists OS X as the iPhone's operating system, yet the iPod Touch has no mention of an operating system. I would have thought that OS X would have also been used for the iPod Touch. Maybe this is just an oversight. If they are using OS X on the iPod Touch, this would clearly show a strategy of projecting OS X to new computing platforms which could be quite significant. I finished my review of Ilium ListPro 5.0 and it should be published on pocketnow.com sometime this week. Continue my review of the Etymotic ety8 Bluetooth headphones. Sling Media released an update to the Slingbox firmware which contains miscellaneous fixes (link). 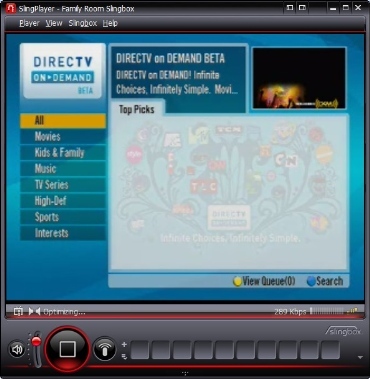 I have not had any problems with my Slingbox Pro, however Sling Media recommends the upgrade to all users. I downloaded it last night. After executing the update on the machine you configured Slingbox with, running SlingPlayer will detect the new firmware version and install it on the Slingbox. This is a very easy and painless process.